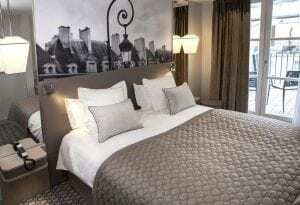 The rough poetry of a no frills easyjet flight could not be in starker contrast to the tranquil, sumptuous streets of Paris’ Latin Quarter and the urban-chic boutique hotel La Lanterne, nestled neatly within its winding cobbled streets. Peppered with independent bookshops, art house cinemas and Parisian markets, it’s impossible not to be swept off your feet by the sheer romance of this most picturesque, effortlessly cool part of Paris. La Lanterne could almost be missed, so discreetly is it tucked away. Enter its lobby and you’re immediately aware that you’re somewhere aesthetically inviting, languid and quintessentially modern with its sumptuous chic colour scheme of greys and plums by Les Heritiers, Pierre Dubois and Aimé Cecil. The reception staff are warm and friendly and are happy to advise you about all that this very special part of Paris has to offer. The hotel is compactly elevated over five floors with a wellness centre, comprising a luxury pool complete with rippling waves, a turkish hammam, steam room and a sensorial shower to massage away your stresses and strains – if you have any left after all that. La Lanterne knows how to treat its visitors and this hotel was made with relaxation in mind and it’s comfort, combined with style that gives it its well deserved four star rating. The rooms are pristine and modern, extremely comfortable and well stocked with everything from bathrobes and slippers to manicure sets and cotton buds, all furnishings and finishings at the high end of the market and tastefully decorated in keeping with the boutique feel. Overall it feels effortlessly chic, the perfect haunt for professional couples looking for a Parisian break or those over on business or anyone who wants to enjoy the best of central Paris in the knowledge that they have the calm and serenity of La Lanterne and its tranquil garden with soothing water feature and spa awaiting them on their return. This is truly the Paris of Truffaut and Godard and a walk through its winding streets, hanging out in its cafes, bars and restaurants and all the people watching you can fit in, is a great way to while away the hours. 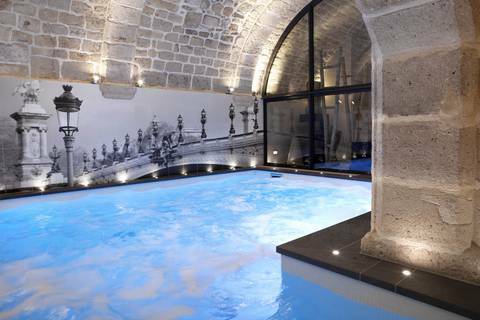 The enticing location isn’t all this charming hotel has to offer however, with its subterranean spa nestled in its picturesque catacombs inviting you to slip into fluffy bathrobes and slippers for a swim and steam in their heated swimming pool positioned under an impressive 12th Century arch. A special mention to their sublime buffet breakfast is essential too as it really is top notch. Choose from a delightfully appetising array of pastries, a cooked breakfast of quality sausages and bacon and scrambled or boiled eggs, cereals and sweet and savoury breads and spreads. In the chill cabinets there are deli meats of every description, freshly squeezed decanted juices, smoked salmon, yogurts and fresh fruit salad. A mouthwatering array all served with freshly made coffee delivered with a smile to your table. Bliss. Leaving both La Lanterne and this wonderful part of Paris at the end of my stay wasn’t easy and I could’ve easily stayed longer, but I left feeling renewed and invigorated and not just a little under the Latin Quarter’s spell. Wondering how to show your loved one how much you care? La Lanterne have given great thought to their Valentines package. Starting the day with a special Champagne breakfast – in bed, of Laurent Perrier and famous pastries from ‘Merveilleux De Fred’ or an exquisite breakfast buffet. Following that, what could be more romantic and glamorous than a private cruise of La Seine in a Riva boat made for two with more Champagne to keep you floating along.